The only gay in the pillage. "No, dad, I said I wanted an 'orse for my birthday!" "Whaddya think? Handbag too much?" Nobody bothered Lucy in the park when she was with her Great Dane. The Fur Norseman of the Apocalypse. "See, I haven't got your Oreo biscuit sweetheart." Try as he might, Daddy continued to be a poor second to Chips. It was the moment Sally found out she was part of a viking line. Girl: "Excuse me, Sir. May I ask who you are?" Man: " I'm the Great Cnut." Girl: "It's my considered opinion that dyslexia is a good thing for rude people, Mister." "The leopard that I wrestled was this big!" 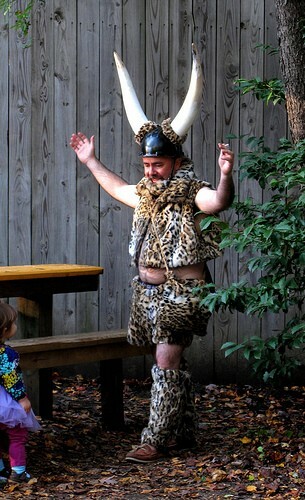 Oh daddy, leopard print was so last season. If Thor had been made in Britain. "How big is my long boat? This long!" You shouldn't let him warrior. Yikes. Walter is Going Beserk.